Electric Jukebox promises music streaming 'revolution' | What Hi-Fi? The Electric Jukebox Company has launched an attack on subscription streaming services. It has released the Electric Jukebox, a device that streams music to your TV without locking you in to a monthly payment or registration. Do you find streaming services too complicated? Does a monthly subscription put you off online music libraries? Then you are the target audience. The Electric Jukebox (as opposed to the gas-powered one) wants to combine the music catalogue of streaming services with the plug-and-play simplicity of a CD player. 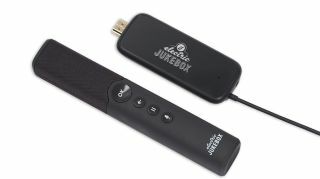 The Jukebox is a stick that plugs into your TV’s HDMI and 3.5 and streams music to it over wi-fi. It takes power from the mains or via micro USB. Once connected, you have access to a library of music tracks. You could do a similar thing using a Google Chromecast and a Spotify account, but the Electric Jukebox doesn’t need monthly payments or account registrations. You pay a one-off price of £180 for the device, which includes a £60 one-year music pass for "tens of millions" of tracks and ad-free listening. After that, the service is free if you are prepared to listen to ads in-between the music, or you can continue to pay an annual fee of £60 for the premium ad-free service (like Spotify). You’ll get "millions" of albums, curated music channels and celebrity playlists. While the service talked of "CD quality" music, we've since confirmed music files are 320kbps, the same as Spotify Premium. You may need to plug speakers into your TV first, though, as we'd take issue with the company's claim that "TVs these days have fantastic sound". Thankfully, the device also has 3.5mm and Bluetooth outputs. Celebrity curators for the service include Sheryl Crow, Robbie Williams, Stephen Fry and Alesha Dixon. The idea is to turn your TV into an old-school jukebox, only instead of walking up to it and pressing buttons, you do that with a remote control that offers both gesture and voice controls. “We want to bring music back into people’s living rooms,” said Rob Lewis, CEO of Electric Jukebox Company. Is there a catch? Well, it's not quite subscription-free. Your first year is included in the initial £180, but each year after will need a £60 music pass unless you want to start watching ads. It appears to be a two-tier system, just like the premium and free versions of Spotify. Pre-orders start today on the Electric Jukebox website – get in before 21st October and you get the early bird rate of £150. The Electric Jukebox will be out before Christmas.